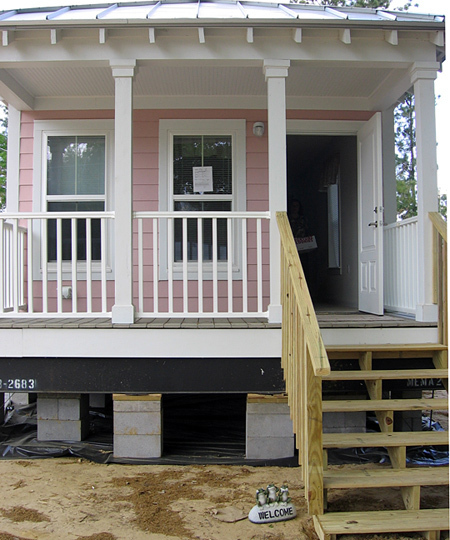 'Katrina Cottages' Wait to Become Homes "Katrina Cottages" – the alternative to FEMA trailers — are kind of a cross between a trailer and a house. But barely 2,000 of them are in use. The federal program to distribute them has been mired in red tape — over contracts, permits and zoning. Brenda Acosta's new two-bedroom Katrina Cottage in Carrier, Miss., has air conditioning and a kitchen. Katrina Cottages come in several models, ranging from 612 square feet to 1,112 square feet, with between two and three bedrooms. Want to see floor plans? You can view renderings and blueprints of the cottages that Marianne Cusato and others designed. The kitchen in Acosta's new cottage. Acosta's cottage sits not far from her FEMA trailer and another mobile home. After Hurricanes Katrina and Rita hit land, Congress gave FEMA $400 million to design an alternative to the trailers that the agency distributed along the Gulf Coast. The result – known as the "Katrina Cottage" – is kind of a cross between a trailer and a house. But more than two years since Congress approved the funds, barely 2,000 of them are in use. Brenda Acosta, who lives in Carrier, Miss., recently received one of the cottages after years of living in a FEMA trailer. 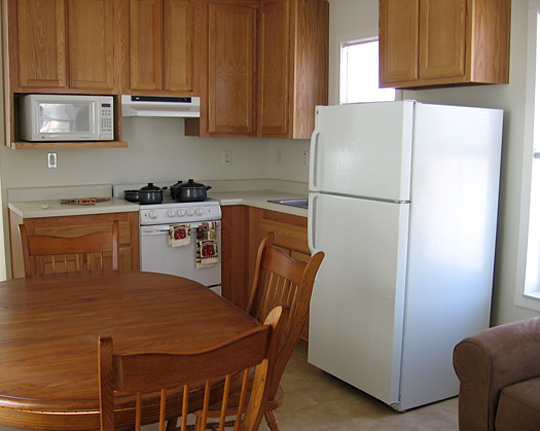 Thanks to the federal grant program, state emergency officials delivered the two-bedroom cottage free of charge. 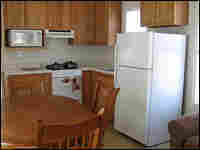 The cottage has air conditioning and a kitchen. Next to her dingy FEMA trailer, it looks like the Barbie Dream House. 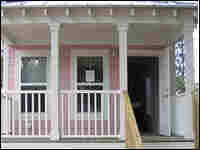 Marianne Cusato designed the Katrina Cottage so people wouldn't have to recover from a disaster in the units FEMA supplied. Those units are sometimes plunked down in parking lots and look "worse than a trailer," Cusato says. "It looks like a shipping container, and people are living in what we are sending freight cross-country in and it's not enough," she says. "We can do better as a society." The solution she created is a prefab shotgun house that could be built quickly, in large numbers and delivered on trucks. If you put wheels on a Katrina Cottage, it's temporary. If you dig a foundation, it's permanent. And that's part of the problem. States participating in a FEMA grant program weren't sure which it should be. And in places like Louisiana, Texas and Alabama, the cottage program has been mired in red tape — over contracts, permits and zoning. Randall Kinder, who runs the cottage grant program for FEMA, stops short of detailing the problems the states have encountered, but he does give a nod to them. He says some of the confusion has been focused on what kind of permits to give, how to deal with finding the right location and what kind of nonprofit organization to partner with. "These are things that made each project very interesting, and that's why each one is running at a different stage," Kinder says. 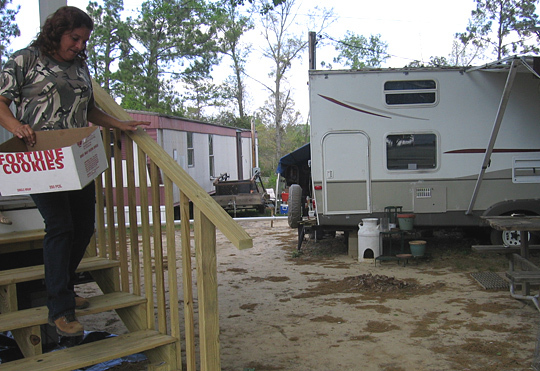 Mississippi has built and delivered 2,000 Katrina Cottages to people like Acosta. "When you look at the intent of our program, we would like to have placed a unit with everyone who was eligible," according to Keith Johnson, who directs the Katrina Cottage program in Mississippi. At a Gulfport, Miss., staging area, dozens of cottages stand like pastel perennials sprung from a gravel lot. Johnson says many storm survivors wanted a cottage but couldn't get one. Cities and towns erected a maze of permitting requirements. Communities feared today's temporary cottages would end up tomorrow's neighborhood blight. "It's an obstacle and continues to be an obstacle, and unfortunately, there are some families that are paying the price," Johnson says. That means Acosta is one of just 2,100 families who have successfully swapped their trailer for a cottage. And the state plans to take her cottage back in a year. Acosta says she hopes that will be enough time to get back on track with her job and home repairs. But really she wishes the state would let her keep the cottage. She says she'll pay them back. "It's been almost three years now, and you would think that people would be on their feet, but it's like you keep trying and trying and can't get anywhere," Acosta says. Whether Acosta will be able to keep her little pink cottage is up in the air. And so is the bigger question of whether Katrina Cottages will be FEMA's top choice in the next disaster.